I also ordered quartz grey, was wondering if I should have gone for the petrol blue, are you happy with the quartz grey? Steve, I had the same feeling whilst waiting for mine! I'd almost forgotten what the grey colour looked like - I'd only seen it on some smaller Skoda (Yeti?) in the dealership carpark. Now its here, I can say I'm loving the quartz grey and I'm pleased I picked it. Thanks for that - you have put my mind at rest! Have a great Christmas whilst enjoying your new car! Got the news today that mine is ready!! Picking it up on the 24th, Christmas Eve. Got the dealer to send me a video of it, just to prove he actually has it!! Quartz Grey, Pano, Tow Bar, Virtual Dash, DCC, ACC, Canton, Heated Screen & Wheel, Blind Spot, Lane Keeping, Sleep Pack, 360 Camera & Towing View, etc, etc. Just heard that my car has now arrived at Sheerness. Only got to travel 40 miles or so to the dealer. So should be on for a mid Jan delivery! 1.5 TSI 150PS DSG Edition in Petrol Blue. Reversing camera. 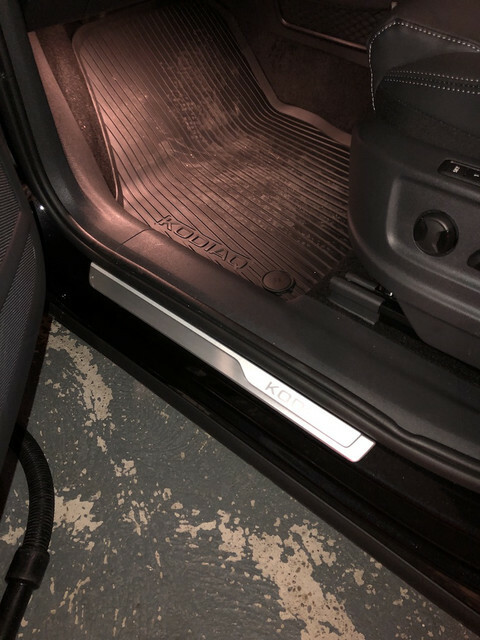 Does the Edition model come will door sill covers? Was considering as adding as an accessory when I pick up my new car. Won’t need to if the Edition comes with door sill covers. If by door sill covers you mean the silver strips, then yes.